After receiving good GCSE results, Joseph Lambert was expected to continue his academic success throughout his A-levels, but this did not materialise. "My mother was diagnosed with breast cancer – it was a very fraught time for me, and I think I just lost my academic drive," he says. "As a result, I only just scraped the grades I needed to secure my place at the University of Aberdeen." Like many students, however, Joseph found undergraduate study far better suited to him, and he credits it with "reigniting my passion for study." Throughout his degree, Joseph went from strength to strength, spending a semester studying American History at the University of Oklahoma and going on to win the Jeanette King Award for the best honours dissertation in the department, on the notion of 'the frontier' in literature, history and philosophy. "By the end of my degree, I knew that I wanted to carry on my studies," says Joseph, who graduated with a First Class honours degree. "The only question was what to study and where!" 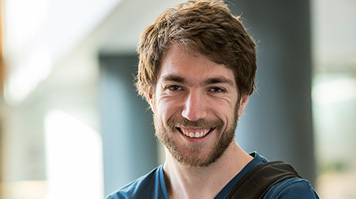 As a lifelong environmentalist, Joseph began looking for Masters courses that would help him to move into a position where he could make a positive impact on environmental policies or laws, and decided that a CPE would be the ideal stepping stone into a career doing precisely that. "Having decided on a CPE, I looked into all the possible places I could study, and LSBU immediately stood out," says Joseph. "I didn't want to study Law somewhere that is antiquated or elitist, but somewhere modern and down-to-earth. LSBU's course is accredited by all the relevant legal bodies, meaning it is just as well-recognised, and it is the kind of university I feel much more comfortable in." As with most postgraduate students, cost was also an important consideration for Joseph and LSBU again fitted his requirements perfectly. "Other universities are charging almost three times as much for the same course," he says. "At a time when there is less and less funding for postgraduate study, it's so important that LSBU continues to offer good courses that are affordable to those without financial backing." Having made his decision, Joseph applied for a Vice-Chancellor's Scholarship in the Merit category, available to those with a 2:1 degree, and was delighted when he discovered he had been awarded one. "To be honest, I was ecstatic," he recalls. "I had to read the letter several times through to be sure, and if I was the type of person to scream with joy, I'd have woken all the neighbours. As it was I could not stop grinning randomly or dancing – without warning or skill – for days afterwards. "It's made a huge difference to my studies. I'm not sure what I would have done without it – I'd have probably had to take out a personal loan or carried on working, but there is no way I would have been able to give the course my full attention if I had done so – as a result of the scholarship, I'm enjoying every second of my studies, and I can't thank LSBU enough for that." For Joseph, his academic success is a vindication of the commitment and hard work he has put in, often in very difficult personal circumstances. "I had to study throughout my mum's battle with breast cancer, heart disease and, recently, bowel cancer," he says. "I've worked to support myself throughout my undergraduate degree and full time during the summer to be able to support my studies. While there are people out there in much more difficult circumstances, it certainly hasn't been easy for me – growing up with a single mother and not much money has often made staying in education an uphill battle, but it is one that I am delighted I stuck with." Joseph's journey will not stop with his CPE, however, and he is already looking towards his future. "I want to practice as a barrister, and I'll always be looking for ways in which the law can be made to work for a better environment," he says.